The Eclipse Ts2R is a compact inverted research microscope that is configurable with a wide variety of observation methods. The broad range of observation methods, smaller body and improved ease of use will directly benefit research laboratories and improve workflow. Control buttons on the new Eclipse Ts2R microscope are intuitively located for a streamlined workflow. The on/off and diascopic/epi-fluorescence switching controls are located on the front panel while buttons pertaining to either diascopic or epi-fluorescence control are zoned to the left and right sides of the microscope body, respectively. The newly developed rectangular mechanical stage on the Eclipse Ts2R has a long travel stroke, enabling users to observe an entire 96-well plate. You can also set the limits of the XY travel stroke depending on sample and vessel size. The stage height has also been lowered by approximately 30% compared to the standard research microscope*, thereby reducing fatigues during repetitive operation and sample exchange. New LED-based diascopic and epi-fluorescence observation. In addition to conventional contrasting methods such as Phase Contrast, DIC, and Nikon Advanced Modulation Contrast, the Eclipse Ts2R also provides a newly developed Emboss Contrast technique to support imaging through both plastic and glass culture chambers. Thick samples such as cancer cells, oocytes and embryos which are difficult to observe with conventional phase contrast methods, can also be easily observed with Emboss Contrast which provides high-contrast, pseudo-three-dimensional images without the need for costly optical components. 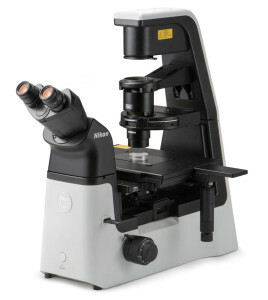 The depth and height of the Eclipse Ts2R microscope body is approximately 10% smaller compared to the standard research microscope. * Both diascopic epi-fluorescence models are designed with space-saving compact bodies and provide improved workflow in the laboratory. The fluorescence model features a built-in fluorescent light source and illuminator to aid in the compact design. Optical accessories, such as DIC components, achieve the same performance standard as Nikon’s Eclipse Ti inverted research microscope, providing exceptionally clear, sharp images.